Gold has weakened in the face of a rising dollar, in part due to trade war worries. Gold was mining a new one-year low Thursday as the dollar index rose to a fresh one-year high, but the precious metal has become more correlated with the Chinese yuan, also at its weakest in a year on trade woes. Analysts see further weakness for gold, but say things could turn around if the dollar steadies on positive trade developments, or if the negative consequences of trade wars drive buyers into gold as a safe haven. At some point, trade wars could make investors run for the safety of gold, but right now they’re running away. Gold has broken to fresh one-year lows and is heading toward $1,200 per troy ounce, now that spot prices have broken $1,220. Gold has languished on soft physical demand and lackluster investor interest, as trade tensions and rising U.S. interest rats drive the U.S. dollar higher and spark selling in global commodities markets. "In the current environment, gold is really struggling to garner that safe haven demand," said Suki Cooper, precious metals analyst at Standard Chartered. "It seems to me a lot of that has to do with the fact that we're in a physically weak period, and you normally would have a better floor for prices." Gold has been falling with other commodities, like copper, now nearly 20 percent from its December high. Gold is about 11 percent from its April high and is trading at the lowest level since July 11, 2017. "Gold does have the ability of a recovery this year, and I think there's a significant risk with the [yield] curve being near inversion here that things may be slowing, and the Fed isn't going to be as aggressive into 2019. We do see a reversal of U.S. dollar, basically helping gold into next year," said Bart Melek, head of commodities research at TD Securities. The Treasury yield curve has been seriously flattening, and the 10-year yield and 2-year yield are just 24 basis points apart, the narrowest since 2007. An actual inversion, which happens when the 10-year yield drops below the 2-year yield, would be a recession warning. 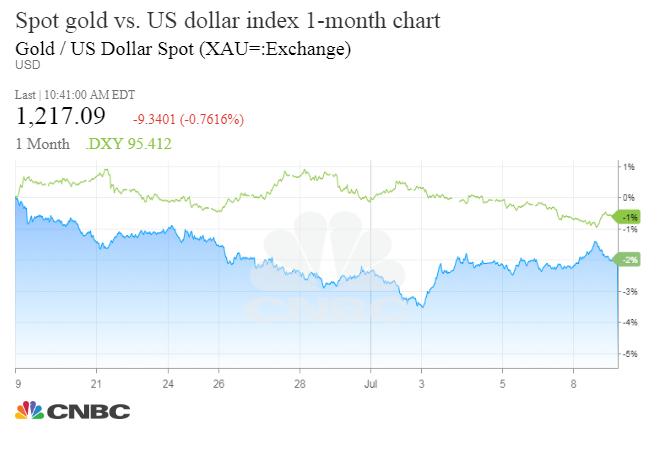 The dollar's strength is also in sharp contrast with the Chinese yuan, which has sunk to a new one-year low against the dollar on trade worries and has now become correlated with gold. For gold to make a turn, the dollar may have to stop rising, either on positive trade developments, a slowdown in Fed rate hikes — or a really negative development in trade. The trade wars could also become a positive for gold if there is serious escalation, and investors look for a safe haven other than the dollar. Trade conflicts could also drive up inflation — something gold responds well to. They could also weaken the global economy, another positive for gold. Ultimately, if they do enough damage, the Federal Reserve could pause from its interest rate hiking and that could weaken the U.S. dollar, also a plus. "I think it's an unusual period we're in —July and August when we tend to see very little physical buying anywhere," Cooper said. "September will give us an idea of whether we're seeing a structural change in the market. We also expect some of the strength of the dollar to fade." 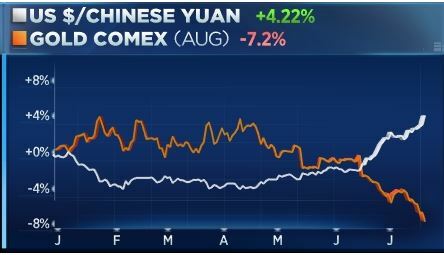 China is one of the main markets for gold, and the weakness in the Chinese yuan is not a good sign for the metal. "Emerging markets are a double whammy. They have liquidity issues. They can't really be buying gold," said Melek. "Their equity markets have really gotten hit, and so have their currencies. They are a big consumer of the stuff. We've had weakening of the [yuan] in particular, and it hasn't been a great story. Certainly, U.S. Federal Reserve policy doesn't help." Cooper said gold is getting technically oversold, but it's not pricing in a negative outcome from trade war worries. "We're still seeing some concern that inflation could pick up but there's not enough concern about inflation or inflationary pressure to see investors allocate into gold. We're in no man's land. The dollar is weighing on the market. The Fed is hiking, but we're not seeing inflation that would bring people back into the market. Where prices are at the moment it will be interesting to see if there is a physical demand market response," she said. Cooper said one positive for the gold market is that in India, one of the biggest gold buyers, the rupee-gold relationship has become a positive for the precious metal and could spur buying. The ratio fell below 30,000 rupees for 10 grams of gold Wednesday for the first time since January, and that could be an important catalyst. "To stimulate demand in a period where they're not usually buying will take a much lower price than we've been seeing," she said. Gold's decline may also start to attract contrarian investors. Bank of America Merrill Lynch's monthly fund managers' survey showed that a record number of managers, 17 percent, saw gold as undervalued. BofA strategists said it would be a contrarian buy.